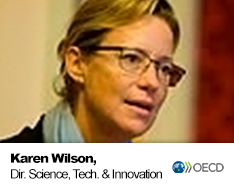 Karen has been working at the OECD since 2009 where her work has focused on innovation, entrepreneurship, and finance including angel investment, venture capital, impact investment as well as the role of private finance for sustainable development. She is also an Associate Fellow at Said Business School at Oxford University and a Visiting Lecturer at the Stockholm School of Economics in Riga. In addition to other boards and advisory positions, she serves as a board member of the European Venture Philanthropy Association (EVPA) and on the Harvard Business School Impact Investment Alumni Steering Committee. Karen is the Founder of GV Partners, a research and consulting firm focused on entrepreneurship and finance. She was a Senior Fellow at Bruegel, an international economics think tank based in Brussels from 2012-2017 and a Senior Fellow at the Kauffman Foundation from 2008-2012. Earlier, Karen worked with international venture capital firm, Index Ventures, and before that was part of the senior management team at the World Economic Forum in Geneva, Switzerland. Previously, she served as the Executive Director of the Global Initiative at Harvard Business School. Her earlier experience includes investment banking and consulting.